UPDATE: Rush will play the Halifax Metro Centre, Friday July 12, 2013. It's true! Rush fan club members awoke this morning to an email announcing dozens of more shows for the Spring and Summer 2013 legs of the Clockwork Angels tour. Just weeks after podcaster, author and filmmaker Kevin Smith, on a Rush-and-kush streak in sunny Los Angeles, said he would try to get Rush to come to Halifax, it appears the dreams of music fans have come true. 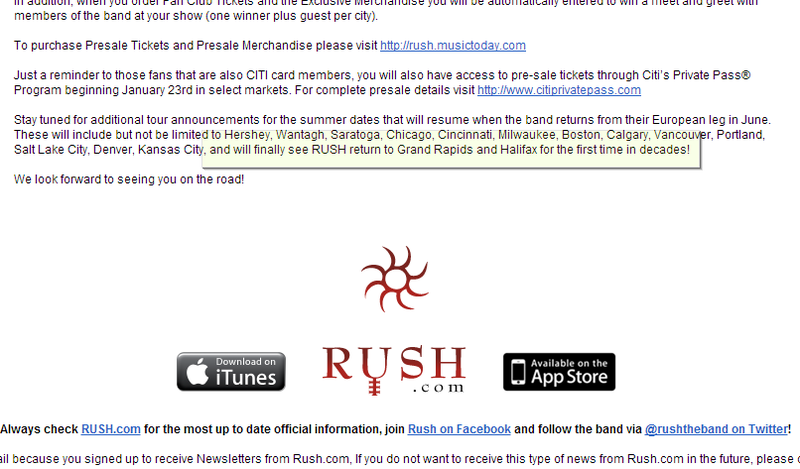 RUSH coming to HALIFAX in SUMMER 2013 to tour CLOCKWORK ANGELS! Scott is too excited to see Rush again. Rush is coming back to Halifax in 2013. “Stay tuned for additional tour announcements for the summer dates that will resume when the band returns from their European leg in June. These will include but not be limited to Hershey, Wantagh, Saratoga, Chicago, Cincinnati, Milwaukee, Boston, Calgary, Vancouver, Portland, Salt Lake City, Denver, Kansas City, and will finally see RUSH return to Grand Rapids and Halifax for the first time in decades!" Decades, indeed. 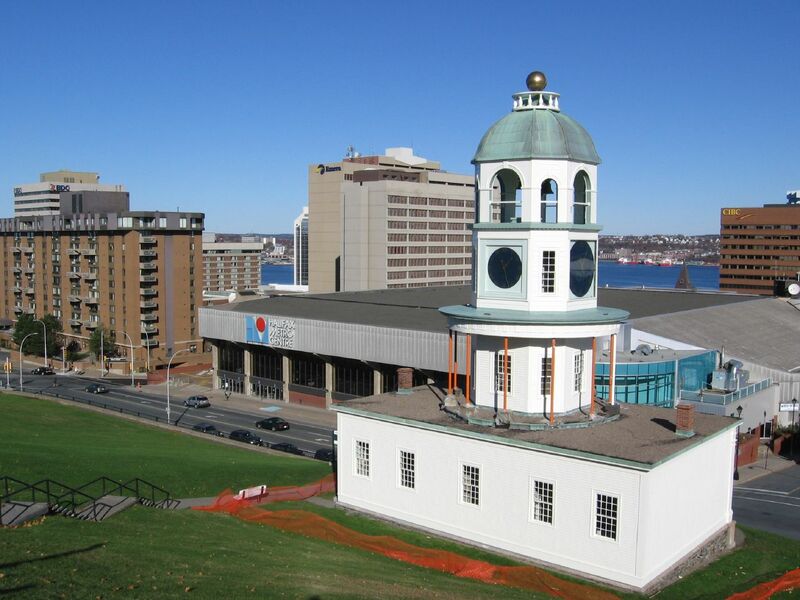 It's been more than 25 years since Geddy Lee, Alex Lifeson and Neil Peart played Halifax. The last time was November 2, 1987, when they performed at the Halifax Metro Centre with Chalk Circle. No, the concert you saw on Trailer Park Boys was not real. The footage in that episode was shot at Toronto's Air Canada Centre. I was there when Bubbles came out with Alex's guitar. What a moment. I haven't seen Rush in person since I moved to Halifax in 2005. I've seen them in Toronto on the tours for Presto, Roll The Bones, Counterparts, Test For Echo (twice), Vapor Trails, Feedback....was that a tour? It's not clear whether this development had anything to do with the Rush The Hill petition campaign. Maybe it did. Maybe Kevin Smith used his extensive entertainment industry connections to grease the wheels. Maybe Rush has already played all the Big Money venues and is doing the next leg because they are benevolent and omnipotent rock gods. Maybe this is karmic payback for all the shenanigans of the City Hall cash-for-concerts scandal. I don't know. I JUST WANT TICKETS. Rush Halifax Clockwork Angels concert date has yet to be announced, but I'll let you know when I find out. And since some don't believe it until they see it -- who can blame them after years of rumours -- here's a screenshot of the email that went out today. There you have it! Rush returns to Halifax in 2013 for the first time in a generation.